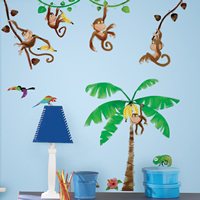 Add adventure to your walls with our animal wall stickers. RoomMates animal wall decals feature our most popular collections including jungle animal wall stickers, woodland animal wall stickers, farm animal wall stickers, Rocketdog and more. From horses to puppies to giraffes and monkeys, all our animal wall stickers are completely removable and repositionable. Transfer them among any flat surface and decorate your little one's room in just minutes. Browse our adorable animal stickers above to get started!